Home » Promotions » Ace2Three’s Brand New Commercial – Everything is fair in Love and Rummy! Ace2Three’s Brand New Commercial – Everything is fair in Love and Rummy! Ace2Three's Brand New Commercial – Everything is fair in Love and Rummy! 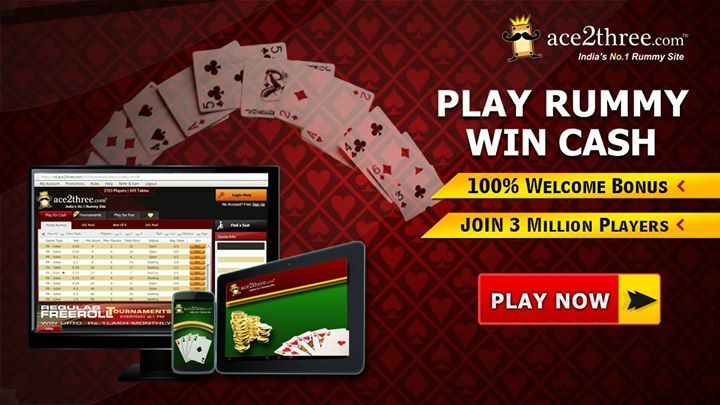 Ace2Three – the unbeatable leader of online rummy games in India has around 8 million users associated with it. It is a great achievement in just a few years. Ace2Three claims to be one of the oldest online rummy games playing platform in India that looks after the interests of players by providing useful gaming resources to each of the players who joins this website. With this, Ace2Three never fails to lack behind in its marketing efforts. It has now brought a brand new rummy commercial to attract the audience. Check out the commercial titled – “Everything is fair in Love and Rummy”. Rummy is one of the most entertaining games online. It has a long lasting effect on people. The video above represents a family who is into the jewelry shop to buy some pieces of jewels. While the fan’s wife and daughter are busy in finding the right necklace and earrings for them, the man decides to play rummy by arranging the rings and earrings in a proper rummy card sequence. Everyone is stunned, but the salesman, who himself is rummy enthusiast knows what the man is doing. Finally, he succeeds in arranging the jewelry in a correct rummy card sequence after the salesman passes him diamond shaped earring. The video is the pure delight made to promote Ace2Three with sheer brilliance. Why Ace2Three is the Best Rummy Playing Site across India? One of the oldest rummy playing websites, Ace2Three has created its aura by providing the most versatile services to the rummy players who join this website. The sign-up bonuses, game playing bonuses, gifts, refer & earn program, tournaments, and the presence of mobile app makes it different from other rummy playing websites. It provides the players an opportunity to download the rummy app for Android and iOS and enjoy playing the game endlessly. The smartphone users can either download the apps or can even play the rummy games by signing up on the Ace2Three’s website. Is Playing Rummy on Ace2Three is Legal? As rummy is the game of skills, no law can challenge that it is illegal to play rummy. Playing rummy on Ace2Three is totally legal and anyone can sign up here to enjoy playing different rummy variants available here. Though the cards a player get while playing rummy depends on luck, but winning or losing the game depends on the skills you have developed. Ace2Three abides all the governmental rules and regulations and therefore makes playing rummy legal on its interface. If you have joined Ace2Three rummy by signing up on its website you can claim your joining bonus and get 1700 chips for free. A player needs chips to play any rummy game. When you lose the game the chips are deducted from your account and if you win the rummy game few chips will be added to your account. These chips are basically of three types at Ace2Three rummy. The play chips are the chips that you need for playing the free rummy games at Ace2Three. You need to bet the desired number of playing chips on a particular table to join it. The real chips are needed to play rummy to win cash. These real chips must be purchased for money. You can join the rummy tables and invest these chips to win cash. The tournament chips needs to be purchased before you join any tournament at Ace2Three rummy. The tournaments bring cash rewards and other bonuses if you end up to be the winner of the tournament. There are a plethora of reasons that will make you choose Ace2Three to play rummy online. Some of them have been listed here. • It is the oldest and most trusted rummy playing websites in India. • It has its mobile app for both Android and iOS users. Now, no need to log in from PC/laptop, you can download app and play rummy on your smartphones. • A number of bonuses are provided to you like joining bonus, playing bonus, gifts, and other rewards too. • You can sign in anytime and you will find some or the other person who is available to play with you here. Ace2Three has gone really popular in the rummy industry. It is one of the big names in India and the most trusted Indian rummy playing website. If you are looking to start your career as a rummy player then take a wise step and avail the joining bonus by signing up with Ace2Three today. Go for it now and join the other 8 million players who are already associated with this website. good advice ace2threes commercia, Service Good. easy to play and win games. Customer service good and immediate . I am following all the tips & trics given on the site about how to play & win cash.